What’s Wrong with Job Boards? However, from the ridiculous overabundance of articles, comments, and recruiting conference content that trashes job boards as if they are the worst source of hire, I am obviously in the clear minority. I continue to see and hear well respected thought leaders in the staffing industry make claims that the value of the job boards is waning and that the quality of candidates on the job boards is low, and it hasn’t slowed down. Because there is such a strong belief that job boards somehow only offer low quality candidates, I am taking the time to offer a different point of view, as well as leverage statistics to prove that the job boards have the same percentage of “A” players as LinkedIn or any other source of hire. Weren’t the job boards supposed to die, like, 5 years ago? Funny how that didn’t happen. It so didn’t happen that they are responsible for more hires than any other source other than referrals. The most recent CareerXRoads Source of Hire Report showed that job boards are still pretty effective, weighing in at the #2 spot. The facts do not support the belief that job boards are an “ineffective” source of hire. 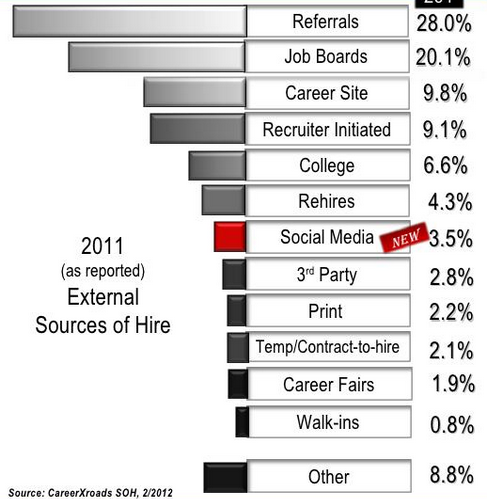 As you can see, job boards also solidly crush social media as a source of hire, which I am sure most people find a tough pill to swallow, especially given that “social recruiting” is supposed to be a magical solution to all hiring troubles. Um, wasn’t social media supposed to kill the job boards? I am sure that it’s supposed to happen any day now, but something tells me that even in the next few years, while the talk of social media killing job boards will continue, the source of hire statistics and surveys will continue to tell a different story. I’ve heard many talent acquisition leaders talk about a desire to reduce their “dependence” on job boards. At first, this seems like a logical desire, but I think it’s important to ask why anyone would feel like they are “dependent” upon job boards. I think it ultimately comes down to the fact that companies don’t like writing big checks to job boards to post their jobs. If job boards like Monster, CareerBuilder and others were free, do you think anyone would complain about being “dependent” on job boards and the need to reduce that dependence on a source that effectively produces a significant number of hires? Is there any other reason why people like Indeed over Monster or CareerBuilder other than cost? And what is Indeed anyway? 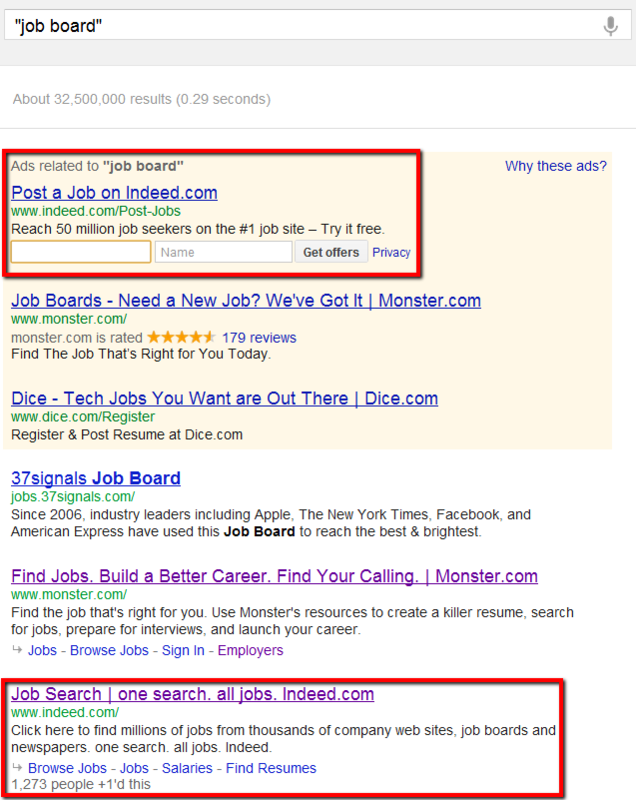 Try Googling “job board” and see what comes up in the #1 sponsored spot and the #3 organic spot. Pretty much the same “job board” search results from Bing as well. If you don’t think Indeed is a job board, I really don’t care what you call it – a job board aggregator, a “job site,” it doesn’t matter. By the way, the CareerXroads study I referenced above categorizes Indeed and SimplyHired as job boards. Regardless, the bottom line is that Indeed is a place where people go to search for jobs, and it’s specifically designed for people to find jobs. Is posting a job on LinkedIn, Facebook, Google+, or Twitter really any different than posting a job on a job board, other than cost, perhaps? And when it comes to candidate response, if you get an applicant from your job posting on Facebook, are they somehow a great candidate because they came from a sexier source of hire than Monster or some other job board? Do you really want to know why job boards haven’t died? It’s because they actually serve a logical purpose. Quite simply, job boards represent a purpose-built talent marketplace, not dissimilar from Amazon or eBay. When people want to buy things, they go to stores or to websites where the things they want can be found for sale – especially places where they have the highest probability of finding what they’re looking for. When people want to buy a car, they go to a car dealership, because that’s where the cars are. When people want to search for a new job, they should be able to go to a place where they can find jobs. While you can find jobs posted just about anywhere, the logical place to go when you are looking to see what job opportunities might be available for you would be a place where the most jobs are (job aggregators such as Indeed, large job boards like Monster or CareerBuilder), as well as perhaps places that specialize in the specific type of job opportunities you’re interested in (niche job boards). I think this is actually one of the main reasons why job boards will likely always be a bigger source of hire by percentage than social media for any company with a significant volume of hires. People finding or being forwarded job opportunities via social media is more by happenstance, whereas people finding and responding to jobs on job boards is more by design. Why do you think Indeed is the #1 online source of external hire according to a study conducted by SilkRoad involving over 700 employers? It’s simply because it makes sense to most people to go to a place where they know they will be able to find a large number of jobs from a number of sources. Now, let’s remember you can pay to sponsor jobs on Indeed, and they now have a resume database. Does that business model sound familiar? By that logic, anyone who responds to a job posting anywhere – on a job board, via social media – isn’t an “A” player. Also, why would someone posting their updated profile on LinkedIn and responding to your job posting on LinkedIn be any different? This stinks of source of hire snobbery, as well as plain old unfounded opinion. Statements like the one above also reek of prejudice and stereotyping. Wikipedia states that a stereotype can be a conventional and oversimplified conception, opinion, or image, based on the assumption that there are attributes that members of the “other group” (in this case, job board candidates) have in common. Stereotypes are sometimes formed by a previous illusory correlation, a false association between two variables that are loosely correlated if correlated at all. Illusory correlation is the phenomenon of seeing the relationship one expects in a set of data even when no such relationship exists, and when people tend to overestimate a link between two variables. However, the correlation is often slight or not at all. I also believe that job boards – both the people who respond to posted jobs as well as those who post their resumes online – represent a cross section of the entire potential candidate universe, and as such, a normal distribution (bell curve). From what I can tell, it seems to pretty much be a statistical inevitability. You’ll have a small percentage of horrible candidates, a large percentage of average candidates, and a small percentage of top-notch talent. The same is true of any company at any one point in time – so if you cold called through a company directory, you’d likely hit the same statistical inevitability: some bad, lots okay/good, some great. I’ll argue that the same is true of LinkedIn, Facebook, Internet, or sourcing of every type. I am definitely not an expert on statistics, but I would argue that the people who enter their resumes into the job board databases are a random sample of the total job seeker population. With some help from Wikipedia to help me concisely explain these points, a random sample is one chosen by a method involving an unpredictable component (which is fair to say in this case, because who can argue that we can accurately predict the subjective and objective “quality” of people who post their resumes online?). The sample will usually be completely representative of the population from which it was drawn – in this case, job seekers. In the case of random samples, mathematical theory is available to assess the sampling error. Thus, estimates obtained from random samples can be accompanied by measures of the uncertainty associated with the estimate. This can take the form of a standard error, or if the sample is large enough for the central limit theorem to take effect. The Central Limit Theorem (CLT) states that the sum of a large number of independent and identically-distributed random variables will be approximately normally distributed (i.e., following a Gaussian distribution, or bell-shaped curve, or “normal distribution”) if the random variables have a finite variance. What this all means is that in statistics, it’s generally accepted that if the sample is large and taken at random (selected without prejudice), then it quite accurately represents the statistics of the population, such as distribution probability, mean, standard deviation, etc. Most of the major job boards claim to have 30M+ candidates in their resume databases – that’s a pretty LARGE sample of the job seeking population, so hopefully you can see where I am going with this. Additionally, I could reference the Law of Large Numbers, which if you boil down all of the technical statistics-speak when you look it up, basically says that the larger the random sample size, the more likely that it “guarantees” stable long-term results for random events. “Stable” results in our case would be that the majority of candidates on the job boards are “average” – with fewer horrible “undesirables” and fewer “A” candidates (see the bell curve coming?). And now for the very unscientific side of the equation…why do people post their resumes online or reply to jobs posted on job boards? From the perspective of an average job seeker, many people see the job boards as an online marketplace, not unlike eBay. Most people who are not in HR/recruiting don’t actually view the major job boards with disdain like so many in HR and recruiting do. If a job seeker relies solely on searching job postings online, they are being proactive in seeking employment, but they are reliant on the reactive response of the firms they reply to – and let’s be honest – most candidates do experience the “black hole” effect when they respond to job postings (auto-responders don’t count here). This can lead many candidates to seek to take more control over the process and be actively sought out by opting to post their resume into a resume database so they can be actively found and pursued by potential employers – kind of like posting something on eBay so that people looking for that thing can find it and attempt to acquire it. Many candidates pursue both paths, thinking they’ll cover both angles. Let’s also realize that some people have not had to switch jobs in the past 5-10 years, and most people are not professional job seekers. For many of these people, they simply respond to the advertisements of the major job boards as the “new” way of finding a job as compared to the last time they may have had a career transition. Why not let 100’s of recruiters try and find you the best opportunity? Aside from the experience they may have with poor recruiters, this is not a bad value proposition. Many people aren’t even aware of how many calls they will get once they do post their resume. But just because they get a large quantity of calls, it does not mean they get a large quantity of quality calls – calls for positions that are very close to their ideal career opportunity. And what about the idea that the best people (aka – the “A” players) all have a magical network of people who can automatically find them their next optimal career opportunity without them having to look online? Admittedly, some people do have this magical network – but even so, there is no guarantee that this network can provide the ideal job opportunity at the right time. I have a large network – and if I were to leave my employer – I would certainly leverage it. However, I do not for one second think that this network can be guaranteed to offer me the best possible match for me, nor all of the other fantastic opportunities out there that neither I nor my network can provide me. I could point back to the eBay analogy – if I am looking to sell something, why would I only limit myself to the people I know? My main point here is that it is not only the “bad” candidates that decide to post their resumes online or respond to job postings – it’s actually statistically impossible, given random sampling, the Central Limit Theorem, and the Law of Large Numbers. I’d also like to take this time to comment on database and talent mining expertise. I have recruited and placed many “A+” candidates (as judged by Fortune 500 hiring managers) from the job boards that my clients and competitors also had access to. This includes a position for a Network Performance Tester at Google that literally hundreds of agency and contract recruiters had been working unsuccessfully for 4 months. How is it that no one else found these people? Only if you can get “lucky” consistently. Just because many people have access to a database, it is not safe to assume that everyone can find the same candidates, or find ALL of the qualified candidates, or find the BEST candidates in that database. Perhaps the people who are always claiming the job board resume databases have low quality candidates lack the proficiency to actually FIND the high quality candidates. There’s nothing wrong with job boards. They serve a purpose, and as long as people want to go to a place where they know they will gain easy access to either a large number of job opportunities, or a small number of highly specific job opportunities, job boards will continue to exist and be a significant source of hire. I think one of the main reasons why people in HR/recruiting don’t like job boards is because they cost money. Most people don’t seem to view Indeed or SimplyHired the same way they view Monster or CareerBuilder, and the only difference is that it always costs money to post your jobs on the latter and not the former. Let’s keep in mind that some things are worth paying for. You may not think that you should have to pay to post your jobs online and get solid exposure, and with Indeed and SimplyHired, you in fact may not have to. However, when it comes to the resumes you have access to on job board resume databases, let’s not forget that actionable data is valuable. Having access to mobile numbers and email addresses is worth paying for IMHO. 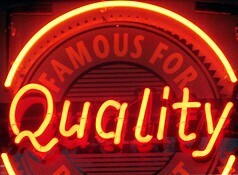 Too many people believe the hype that job board candidates are low quality, but it’s simply not true. If you’re one of those people, please take a moment to consider the laws of statistics, and exactly why people search for jobs anywhere before you are quick to assume that the job boards can only produce low quality talent. With regard to the normal distribution of job seekers represented on the job boards – the exact shape of the bell curve could be disputed, flatter in the middle or more sharply peaked – but I hope I at least provoked some thought by challenging the apparently widely held belief that most job board candidates are not desirable, and that conversely most of the “good” candidates are not on the job boards. I hope you appreciated that I drew upon some statistical and mathematical theories rather than sticking to subjective opinion only and pushing prejudicial stereotypes. And by the way, how do you think the average job seeker would feel if they knew you assumed that simply because they responded to your job posting on a job board (including Indeed, or LinkedIn, or Facebook, etc.) or that you found their resume in a job board database that they were desperate or a poor quality candidate?